If in our web project which we have build with AngularJS as frontend and in backend we have use PHP and in that we want to required add dynamic input fields then you have come on right place. Under this tutorial you can find full source code for add or remove input fields dynamically by using AngularJS and by using PHP with AngularJS we have insert that dynamic input fields data into mysql database. In this tutorial we have make following files. 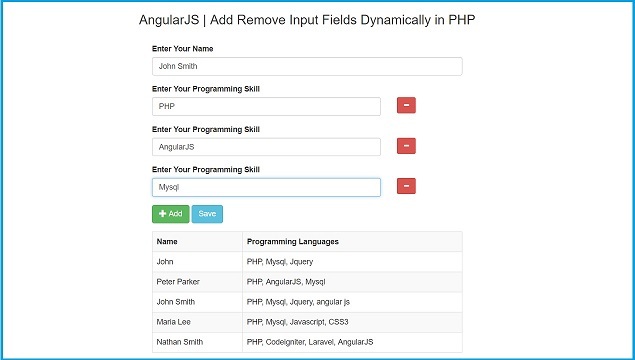 So if you want to learn how to add or remove input fields dynamically in AngularJS with PHP. So you have to just follow this tutorial step by step. This last file of this tutorial and under this file we have write PHP code for save or insert data into mysql database by using PHP with AngularJS. So, this is complete source code of Add or Remove input fields dynamically in AngularJS with PHP. If you want to get complete file of this tutorial then you can download by click on below link. I have a problem want to ask you. For the master table: po_number,supplier and po_date only 1 row for inserting to tbl_po_master table. For the detail table: product_item,qty and unit_price these fields are dynamic for inserting to tbl_po_detail table. For the column "pm_id" is automatically select from tbl_po_master table and inert into tbl_po_detail table. Please create a video related to this problem. Thank you in advance!